Hyundai India, the South Korean auto manufacturer is all set to unveil its first sub-compact SUV - Hyundai Venue in India today. We have already seen some several spy shots and official sketches prior to its India debut. Moreover, the Korean auto giant will also be revealing the sub-4m SUV at New York International Auto Show (NYIAS). Though the SUV will be revealed today, the car maker will be revealing the India prices by next month. The SUV will be priced somewhere in between Rs 8 lakh to Rs 12 lakh (ex-showroom). 2019 Hyundai Venue Sub-Compact SUV Design Sketches Officially Released; Scheduled To Make India Debut on April 17. The official sketch images reveal that the new Hyundai Venue will sport a boxy yet curvy design, which will be highlighted by cascading grille upfront, split headlight, bumper integrated LED DRLs, projector fog lamps, roof rails, diamond cut alloy wheels and much more. 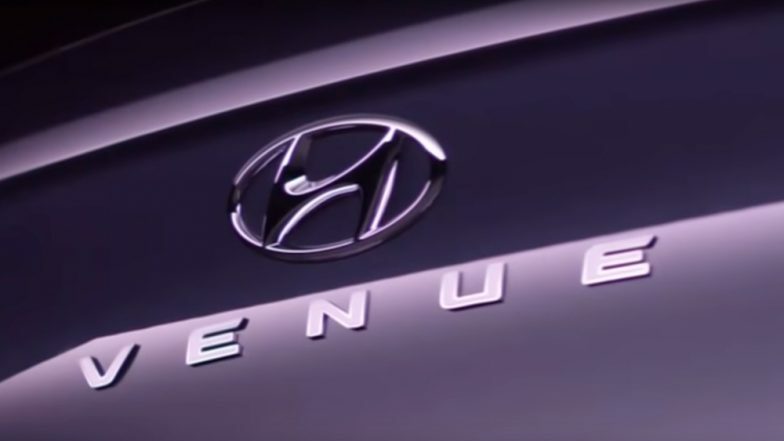 The Venue SUV will debut with Hyundai's Blue Link connected car technology wherein the connected tech will employ an eSIM from Vodafone Idea which will be providing several telematic services. Moreover, the technology will also using cloud-based data as well as artificial intelligence for optimising voice commands for Indians. Mechanically, the Hyundai Venue will be seen in petrol and diesel guises. The petrol engines could be 1.4-litre petrol and 1.0-litre, 3-cylinder turbocharged unit whereas the diesel engine is likely to be 1.4-litre oil burner. Transmission duties on the new Venue SUV are likely to be carried out by 6-speed manual as standard along with an automatic gearbox, Moreover, the 1.0-litre turbocharged petrol engine could be mated to a DCT (dual-clutch automatic transmission). On the feature front, the new SUV from Hyundai will be equipped with an 8-inch touchscreen infotainment compatible with Apple CarPlay and Android Auto, semi-digital instrument cluster, auto climate control, fast charging, sunroof. When launched in the country, the SUV will be pitted against Maruti Vitara Brezza, Ford EcoSport, Mahindra XUV300 and Tata Nexon.